One fast growing trend in the world of young babies is the practice of co-sleeping. While opinions may vary on whether or not sharing a bed with your baby is beneficial, one thing all parents can agree on is the fact that we always want our babies to be safe and comfortable, and if we can snag a few extra ZZZ’s in the process, even better! The DockATot is a structured pillow that allows your baby to safely rest, lounge, play, cuddle, do tummy time, or even get diaper changes in the comfort of a safe docking station. Plush safety sides prevent your baby from rolling and mimics the womb in form. For many parents, this pillow is used in the middle of the bed to keep baby safe from pillows or loose bedding that may cause risk of suffocation. 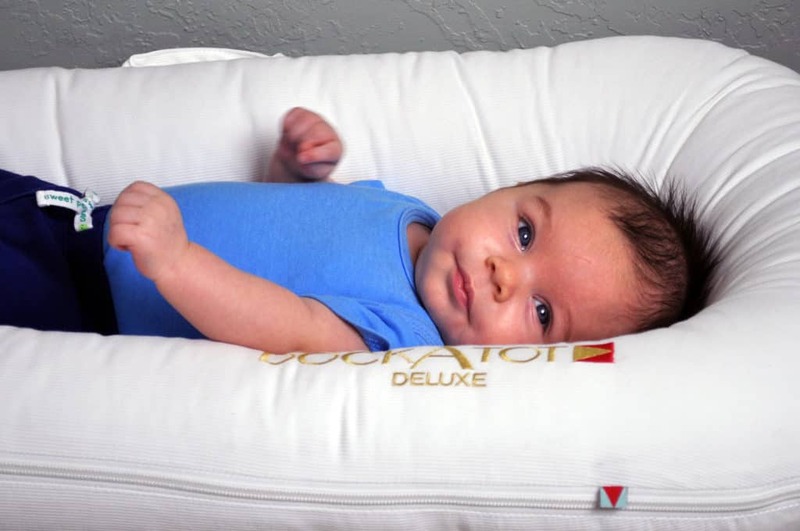 This review of the DockATot will take a closer look at the construction and versatility of this pillow to help you decide if it’s worth adding to your home! 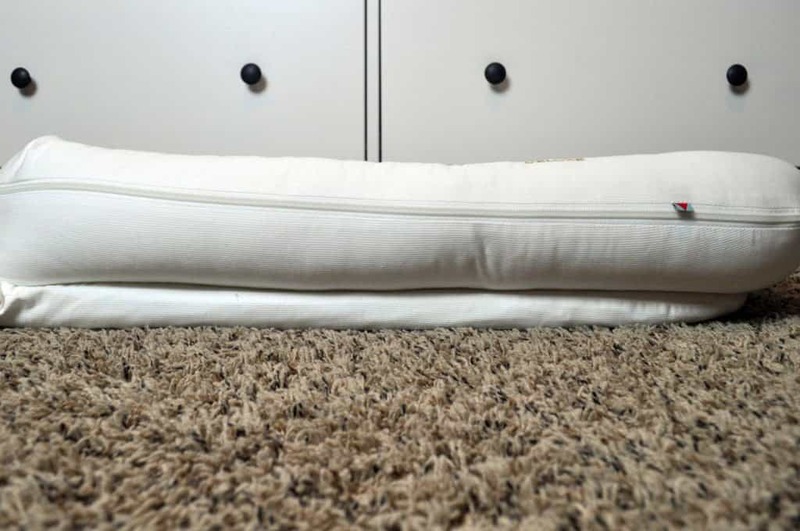 The DockATot docking station pillow is constructed using a two-piece assembly. The bottom piece, a firm multi-fibrous layered polyester fill, serves as the platform for baby to rest. The top piece is a slightly softer loose polyester-cotton blend. This piece, sewn to the base, is a long roll pillow that forms the womb-like sides of the DockATot. Each of these two pieces have a lightweight cotton cover and the platform also has a heavier removable cover that is machine washable. As your infant grows, the bottom of the dock can be unbuckled, which transforms the plush sides from an “O” nest-like shape to a “U” shape, being open at the bottom. The DockATot Deluxe pillow is suitable for infants up to 9 months old. For older babies, there is a DockATot Grand, which is large enough to comfortably fit children up to 36 months old. This larger pod is a great tool for when transitioning children from their crib to a toddler bed. For the DockATot Deluxe, there are many possible uses that can begin to justify the steep $165 price tag. As a docking station during naps or bedtime, as a tummy time aid, or as a changing station- the DockATot Deluxe can become a very versatile item around the house. There is a convenient carrying strap that makes the dock easy to travel with or move from room to room. Additionally, as your child grows and changes, the DockATot can change with them. Interchangeable covers can be purchased to give your DockATot a new look and although the cover can be a bit of a hassle to take on / off, the tight fit ensures that the pillow keeps its unique shape. Let’s review some of the most common ways to use the DockATot Deluxe. 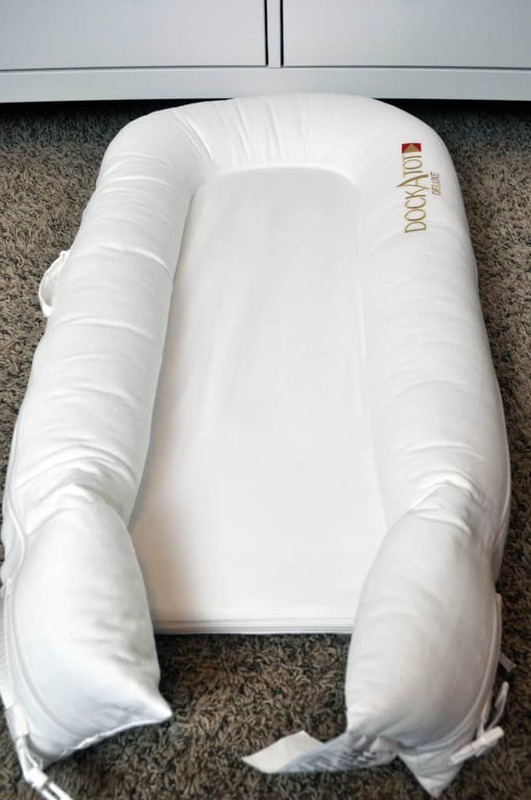 Using this DockATot in the bed or on a couch, I would give it an A-. It’s invaluable peace of mind to know that your child is safe while they sleep. In addition, the ease of having them at an arm’s reach makes for easy nighttime nursing. Some parents even go a step further and claim there are emotional benefits to having baby close while they sleep. The DockATot’s plush sides also help keep our baby, Graham, lying on his back- which is the recommended sleeping position for newborns, as directed by the CDC (Centers for Disease Control and Prevention). The obvious con to the docking station is its size. It is 18” wide and 24-40″ long (depending on if the clasps are open or closed). In a queen bed, this takes up at least 1/3 of the bed and makes it a tight squeeze for a couple to sleep comfortably. Add in dogs or any additional children and you might as well take the couch. For tummy time, I would give the DockATot Deluxe an A. 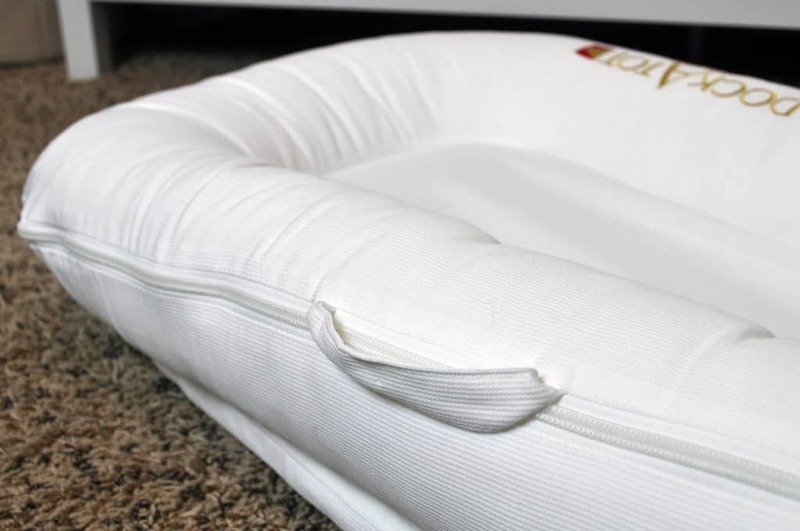 The sides are firm enough that they can support the baby’s weight, yet soft enough that when they tire and lay their heads on the pillow, it is soft, comfortable, and may help make a smooth transition right into nap-time! Tummy time could be any time and the carrying strap makes travel with this pillow a breeze. As a changing pad, I would give this pillow a B. Although this is listed as one of the many uses of the DockATot on their website, I think it’s a bit of a stretch. The bottom cushion does have a washable cotton pillow case, but the ultra plush sides make accessing baby’s bottom quite a hassle for routine diaper changes. In addition, you’d have to take the cover off of the whole pillow in order to wash it when it (inevitably) would get soiled. If you’re traveling, could you use it as a changing pad in addition to all the other uses? Absolutely. But for daily use at home, I believe that there are much better changing pads on the market. Check out our review of the SweetPea Changing Pad by Brentwood Home for an example of one of the changing pads recommended by Sleepopolis. The DockATot Deluxe docking station is a very versatile and convenient product to have in your home. Although the price is high, there are many uses and when considering the safety of your little one, it is important to take all of the necessary precautions. The DockATot uses high quality materials, excellent craftsmanship and considers the small details like non-toxic zippers, convenient carrying straps, travel bags, “the works”. It is a product that can grow with your child and helps facilitate proper sleeping habits. For more information on the DockATot pillow, check out their product listing on Amazon.com. The Dockatot is a versatile, quality, and well made baby sleep product. For co-sleeping, napping, and tummy time it offers impressive performance. The Dockatot is extremely well constructed and uses quality materials. It feels like it will stand the test of time and usage. At $165 it’s not cheap, but it also makes co-sleeping about as easy as it can be.